Dental Implants Toronto and Dentures - Chrysalis Canada | No More Conventional Dentures! 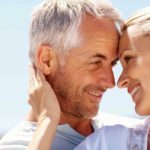 Many patients tell us that conventional dentures prevent them from enjoying life to the fullest. They didn't realize that they were prisoners to their dentures until they received their new permanent teeth. Some of the most common complaints of people wearing dentures are listed below. Do you suffer from any of these symptoms? If so, Chrysalis Canada can be especially helpful to you. Being able to eat with your new dental implant supported teeth on the same day as the procedure. The Procedure is Performed In One Day!. Unlike traditional techniques, some of the implants are placed at an angle - this allows us to take advantage of the stronger forward bone. Prior to the development of this technique, patients often had to endure many long, uncomfortable and expensive procedures, such as bone grafting, to ensure that enough bone was available to integrate with their implants. With Chrysalis Permanent Teeth-in-a-Day, there is far less likelihood of requiring any bone-grafting at all. Best of all, this procedure happens for you in just one day*! They can't eat what they want to eat. They have to eat what they are able to manage to eat. They often develop sore spots because the dentures are resting directly against the gums. Their dentures slip and this can be very embarrassing. As a result, they avoid social situations. Their speech is affected due to denture slippage. They have to be constantly aware of their dentures. They can no longer taste their food properly. Conventional upper dentures cover the roof of the mouth. This is where a significant amount of our sense of taste comes from. They over salt their food because they can't taste properly. This often results in higher blood pressure. The adhesives that are used to hold the denture in place don't taste especially good and when they drink hot drinks like coffee or tea, the paste dissolves and they end up drinking the paste as well. They can't chew their food properly and this results in digestive problems (constipation). They avoid situations that involve intimacy. Their self-confidence is nowhere near where it used to be when they had their own healthy teeth. They no longer actively participate in sports or other physical activities, as they are concerned they will lose their dentures. If you suffer from any of the above symptoms or you are about to lose your teeth and want to avoid conventional dentures, Chrysalis Canada's Permanent Teeth-in-a-Day procedure is something you should learn more about. What is Chrysalis Permanent Teeth-in-a-Day? Chrysalis Permanent Teeth-in-a-Day is a wonderful dental implant solution for people who want to avoid wearing dentures. Permanent Teeth-in-a-Day is exactly as the name describes: permanent, non-removable teeth in just one day. This innovative solution provides:One or two short preliminary appointments will be required prior to the day of the procedure so that we can design your new teeth. After the first six months or so, we replace the prosthetic teeth with a reinforced final replacement set of teeth. At this time you have the option of making small cosmetic changes to your teeth.